146 Selected Favorites (Guitar Songbook Edition). Composed by Jimmy Buffett (1946-). This edition: Guitar Songbook Edition (Hardcover). Artist/Personality; Guitar Personality. Pop/Rock; Rock. Book. 400 pages. Alfred Music #00-44627. Published by Alfred Music (AP.44627). ISBN 1470626551. English. Jimmy Buffett. 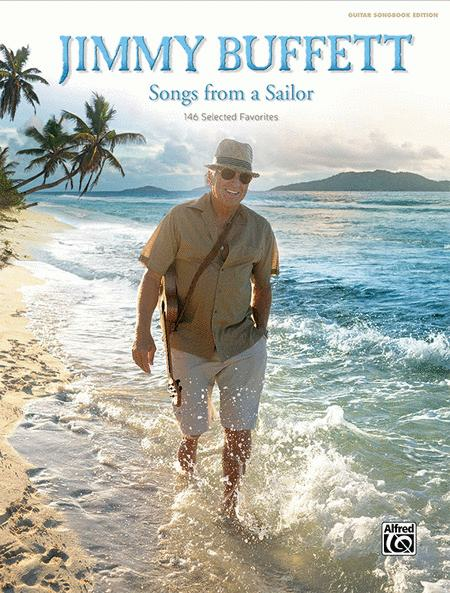 Jimmy Buffett is a songwriter, dreamer, poet, and performer. He's a novelist, sailor, pilot, and entrepreneur. A legend and a lifestyle, Jimmy embodies a unique and free-spirited vision of how life ought to be. This beautiful hardcover edition of 146 songs, personally compiled by Jimmy, is for friends, casual fans, and Parrotheads alike---anyone who has ever been touched by his music and message. The pages within the book also include a full-color photo section, a comprehensive discography, an introduction by writer and co-conspirator Tom Corcoran, and a foreword written by the sailor himself. Titles: African Friend * Autour du Rocher * Bank of Bad Habits * Barometer Soup * Beach House on the Moon * Beautiful Swimmers * Beyond the End * Boat Drinks * Breathe In, Breathe Out, Move On * Bring Back the Magic * Buffet Hotel * The Captain and the Kid * Carnival World * Changes in Latitudes, Changes in Attitudes * Changing Channels * Chanson pour les Petits Enfants * Cheeseburger in Paradise * Coast of Carolina * Coconut Telegraph * Colour of the Sun * Come Monday * Come to the Moon * Cowboy in the Jungle * Creola * Cuban Crime of Passion * Cultural Infidel * Death of an Unpopular Poet * Delaney Talks to Statues * Desdemona's Building a Rocket Ship * Desperation Samba (Halloween in Tijuana) * Diamond As Big As the Ritz * Distantly In Love * Domino College * Dreamsicle * Earl's Dead---Cadillac for Sale * Einstein Was a Surfer * Everybody's Got a Cousin in Miami * Everybody's on the Phone * False Echoes (Havana 1921) * Far Side of the World * Fins * First Look * Floridays * Frank and Lola * Fruitcakes * Grapefruit-Juicy Fruit * Gravity Storm * The Great Filling Station Holdup * Growing Older but Not Up * Gypsies in the Palace * Havana Daydreamin' * He Went to Paris * Ho Ho Ho and a Bottle of Rhum * Holiday * Homemade Music * Honey Do * Hula Girl at Heart * I Have Found Me a Home * I Heard I Was in Town * I Used to Have Money One Time * I Will Play for Gumbo * I Wish Lunch C.